Listen, folks, you’ll have to wait until tomorrow for this recap thing. My experiment with ragda patties proved several things. It proved I have the mettle and the enthusiasm to tackle complex recipes. It proved that pressure cookers are not that hard to work with but they are hard to handle. Practice taking the lid on and off several times so that you don’t get all nervous and fumbly when that thing is hissing at you and you need to take that lid off Immediately. Writing about ragda demonstrates the inadequacy of my current blog design for publishing compound recipes in a way that is readable and printable for anyone who might actually trust that “Chutney Challenged” knows what she is talking about and then come here for cooking advice! I learned, I was challenged, but I also was reminded. I’ve had ragda patties only a handful of times. Even for the most practiced cook with free time like a middle schooler on her hands, ragda patties are work. I was reminded of this as I prepared the ragda patties for New Year’s Eve. Overall, I’d say they are worth it. I’ll try and get some reader feedback to back that up. Call your kids into the kitchen. Ask them to wash their hands. Have them mash and mix all the patties ingredients together (as listed and described in the previous post “Ragda Patties: part one”), except the chilies. You handle those. Form the spiced, mashed mix into patties. A traditional serving of ragda is two patties. I like mine broad and about ½ inch thick. Heat the pan, add the oil, then fry until each side is golden-brown to full-on brown, you can’t see the cilantro anymore. You will, literally, leave your fingerprints all over the patties. Make them to your tastes. Every time you make the patties, they’ll be a bit different. Rinse the vatana under cold water. Keep rinsing until the water running off the beans is clear, not cloudy. Soak the vatana for 8-12 hours. Drain the vatana. Combine with three cups of water and salt in the pressure cooker. Place on the range and turn heat to medium. In about 10-15 minutes, the whistle atop the pressure cooker will begin hissing at you and emitting short, forceful bursts of steam. I use the Hawkins pressure cooker, and each round of hissing ends with progressively more bursts: one, two, three, etc. By the time you get to 6-7 bursts per round, the vatana should be soft and chewable, yet retain their round shape. They are ready. Heat the oil on medium. Once the oil is heated, add the mustard seeds. Watch them until they “pop” – a quiet development that lacks the audible drama of, say, popcorn or curry leaves. Add sesame seeds. Watch them simmer. Smell the difference. 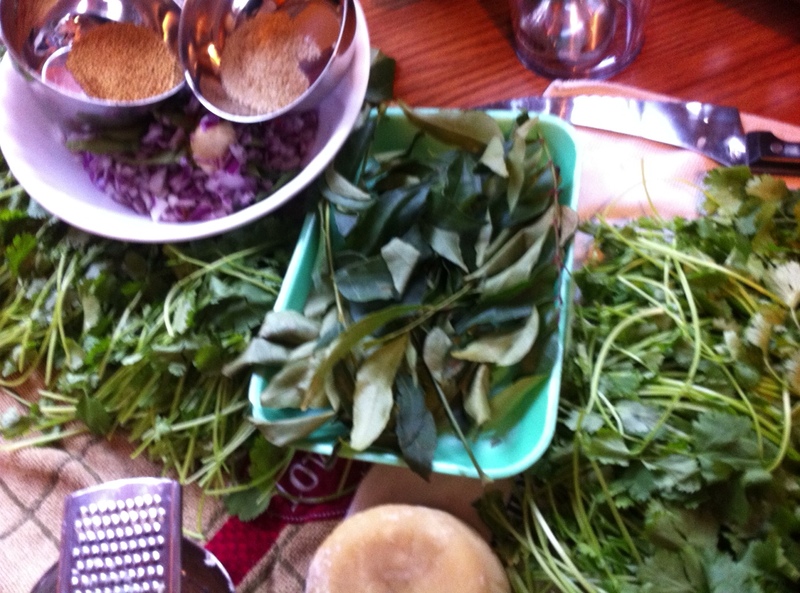 Add ginger-garlic paste, whole curry leaves, chilies, onion. Mix until the onion softens. – about six minutes. Dump (carefully) the vatana and remaining water from the pressure cooker. Add chili powder, turmeric, salt and jaggery. Add tamarind paste. Mix it. Mix it good. Mix it real good. Once you have mixed the ingredients good, mixed them real good, the ragda should simmer for ten minutes. You can add water, and maybe a pinch more of tamarind concentrate. It’s not Mumbai street cuisine if you don’t top it off, liberally, with chutneys and veggies. A good serving size is two patties smothered in the ragda. By the time you ladle steaming hot ragda over the patties, you might not even see the patties anymore. And that’s okay. 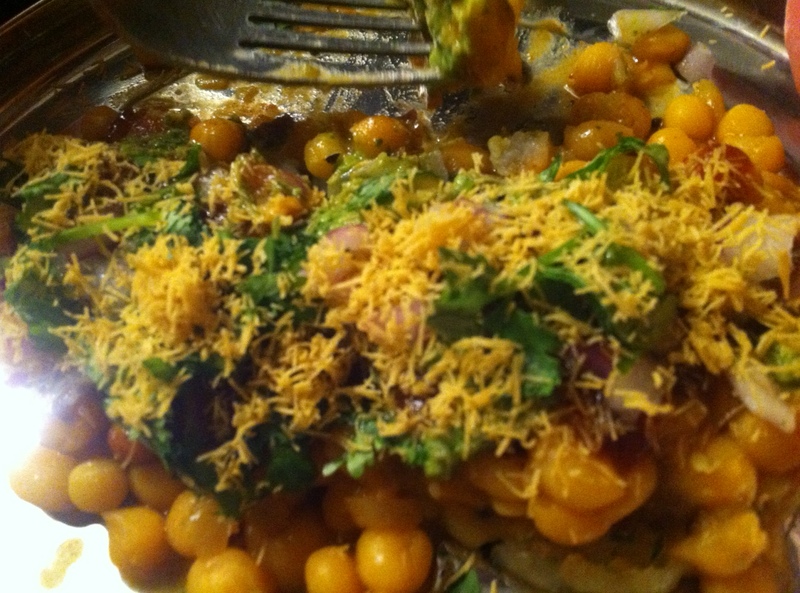 Alternately drizzle each chutney over the ragda. Sprinkle with chopped red onion, then chopped cilantro. Top it off with sev. Please eat. Repeat. Ragda patties provide an immensity of flavor thanks to pounds of distinct, separate ingredients that you marry through heat, garnish, grinding and chopping. Ragda patties is a compound recipe requiring significant prep time. 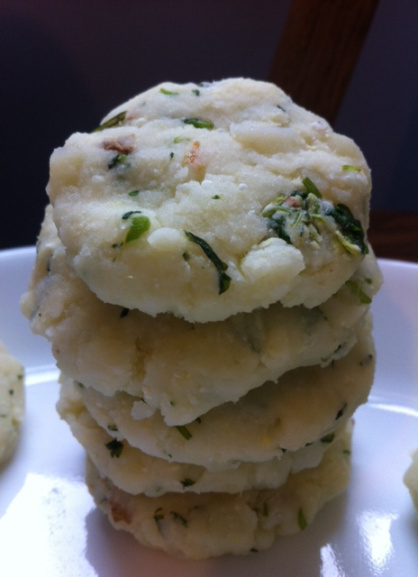 The pattice/patties require boiled mashed potatoes mixed with spices, formed into mealy, zingy potato cakes that you’ll fry. The ragda is a spicy pea gravy that begins as the white, dry, stone-like lentil “vatana.” Vatana needs to soak for eight hours minimum, then be pressure cooked, then be mixed with a variety of spices from tamarind to turmeric. Top the pattice with the ragda. Top the ragda with tamarind chutney, green/coriander chutney, cilantro, red onion and, finally, sev. Serve very hot and prepare for an onslaught of compliments. Ragda pattice are serious. SO are you. Let’s do this. Two cups boiled, peeled, mashed potatoes. Idaho works great. Make the pattice with hot potatoes so freshly boiled they’re almost creamy. Cold potatoes make for flaky cakes. Four chopped green chilies. These can be fun to work with. Just slice off the top, grab a teaspoon and use the dull end to scrape out the ribs and seeds. Your fingers will ache for few hours from the heat of the peppers. Use gloves if you’re concerned. Ginger garlic paste, ¾ teaspoon. This is great to have in your refrigerator for making chutney, as well. Faster and more potent than grating fresh ginger and dicing garlic cloves. Cilantro, two tablespoons. Dice it. Chop it. It will look beautiful in the pattice. Lemon juice, one tablespoon. Overdo the lemon juice a little if you like. I always do! Sugar and salt, 1 to 1.5 pinches/each. One tablespoon oil that holds well at medium-high heat. I use safflower. ½ teaspoon whole mustard seeds. Don’t buy the cracked ones! Ginger garlic paste, 1 teaspoon. Four curry leaves. As far as I can tell, these must be whole leaves, stems removed. Go! Chopped red onion, ½ cup. Red chili powder, 1 teaspoon. Jaggery, 1 tablespoon. As far as I can tell, this is an earthy brown sugar made from the sap of palm trees. It is sold by the bag in small lumps, or in one big flat-topped cone resembling a DIY candle. Grates easily. Use brown sugar if you prefer. Tamarind paste, 1 teaspoon. Not the sauce, not the chutney: the paste.